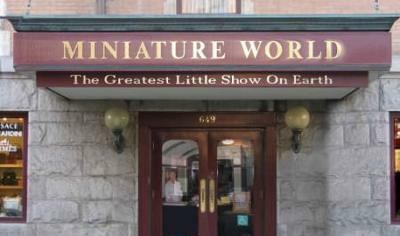 When I traveled to Victoria in 2001, I was surprised to discover the miniature museum there, called Miniature World. I was in the city for the day and this seemed like a novel way to take up some time as we waited for our ferry back to Vancouver. It is such a cute museum. There is exhibit after exhibit of highly detailed, carefully crafted miniature scenes and items. Many of the displays feature working lights and automation. The two exhibits that stick out in my mind are the miniature sawmill (it really works! ), and the battle scenes. And of course it wouldn't be a miniature museum without the requisite display of dollhouses. The museum has dollhouses in spades! This is a museum where you really need to take your time and your full attention is required. I would absolutely recommend this museum to anyone traveling to Victoria, especially those with children, or for the young at heart. There are no real negatives except perhaps a high admission price ($12 Canadian); discounts are offered, however. You can visit the museum's website at www.miniatureworld.com. Buying a used car requires careful consideration of several important factors. You should assess the car's physical condition, service history and availability of service networks for the car model you are buying. A brief snapshot of the history of the prestige car manufacturer BMW. BMW celebrate a century of making cars in 2016. When your car needs work, where do you take it? Here are four reasons to visit the dealership for car repair. I love this website because i have gain a lot of information about Victoria British Columbia Canada from here.It increases my knowledge and i like to visit here again. It's great to hear from you again. After watching such stuff, i am really impressed. Keep it up the good work from now to on wards and I will be returning to you for my queries. You are doing appreciable job and thanks for sharing. I am very lucky for know about these article services. Every article has include with calling cards and custom essay writers service reviews. Those are all improves our student knowledge and users educational reviews. I neediness to add the good-looking machinery in the life in addition this is the preceding option to variety the life expectancy well and reasonable. We all require the accurate in the direction of make the life good in addition this is the right as well. The gentleman can ensure this by taking the apparatuses of the best dissertation service and education or the edification as well. This is an attraction people sometimes overlook when they come to Victoria, with all the gorgeous scenery and historical hot spots there are to visit. Nice to know there are more playful spots too! Join in and write your own page! It's easy to do. How? Simply click here to return to Recommend a Victoria Attraction.